This retro style spinner is a a Ranger product. 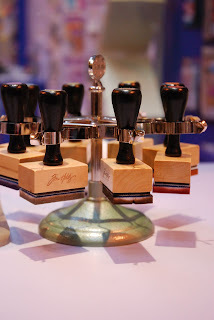 Tim Holtz used it to hold the new ink blending tools, each applicator was destined for a shade of inks and a little colored sticker on the top indicated which one (if you click on the photo you will barely see the sticker on the applicators). 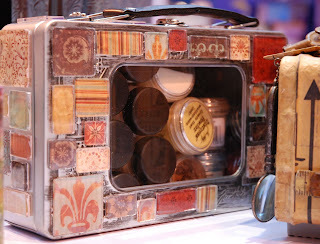 The Cropper Hopper Tim Holtz carry case for embossing powders properly decorated with his new acrylic tiles called fragments. Those two carry cases contain what they were designed for. The one on the left holds the distress inkpads, the one on the right has inside the alcohol inks. 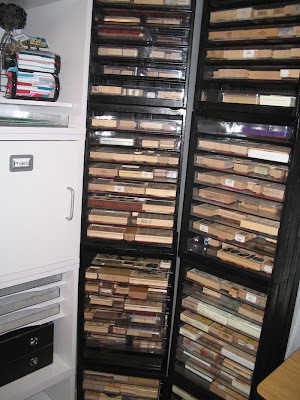 This is not a storage idea but an essential way to know what inks, paint or paper you have got and how they look once applied and dried. Each product range is in a separate ball chain. 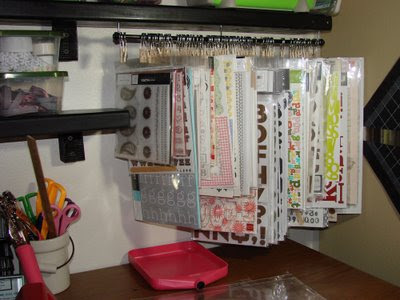 I love the little white shelf thingy with the inkpads and the plastic hanging display with her stamps. For more photosof her studio, click here. 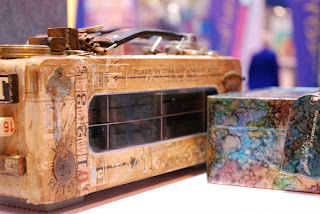 For photos of her great work and an inside to her life, click here. 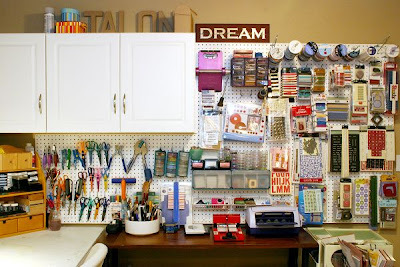 This post is for those who think that is necessary to have a massive studio to create wonders of paper crafting. 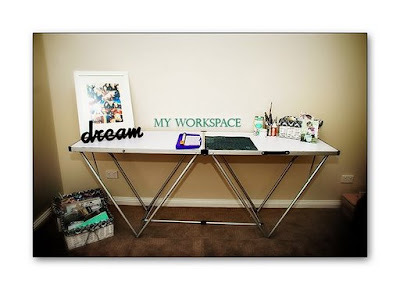 Donna Wild is a super talented photographer and scrapbooker that has this studio. 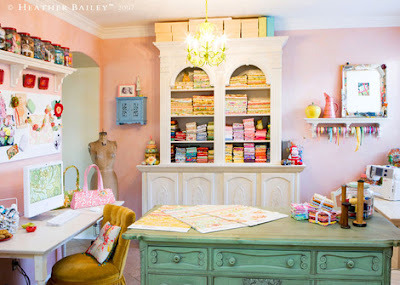 I think it's great, to the point, with little sweet and practical details, and with a large table to craft. for more photos click here. For her personal blog click here. How you ever wanted a self healing mat that fit exactly the size of your table? 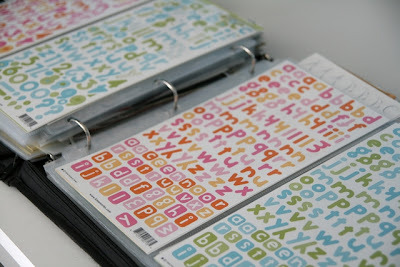 Well you can and even you can choose with or without printed grid. For more info and prices click here. 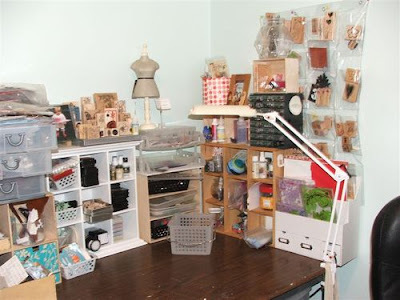 I found it as usual by looking through my favorite blogs, in this case Donna Downey (above, that is her studio, for her blog click here). 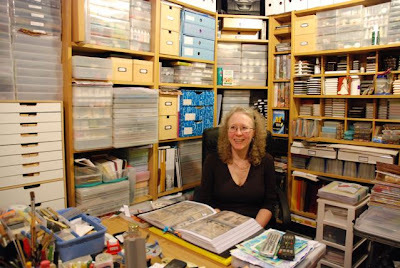 Kim (above) is one of the best stampers I know and has a true amazing studio full to the celieng with stamps, ink pads and card, every stamper dream,. 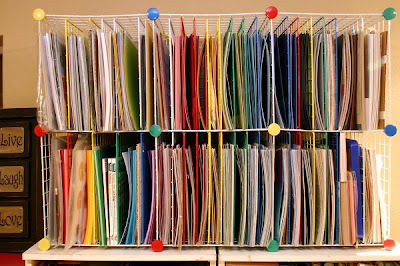 Kim keeps her stamps in A3 plastic envelopes, like the one above, and then stack all the envelopes on top of each other, in a few shelves. 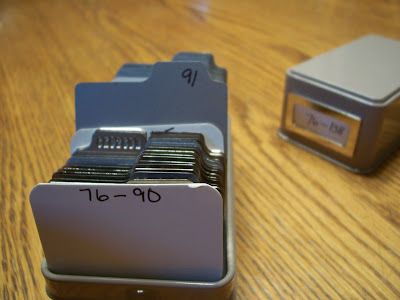 kim has over forty different plastic envelopes which if you multiply the 16 large stamps that fit in each envelope works up to an enormous amount. 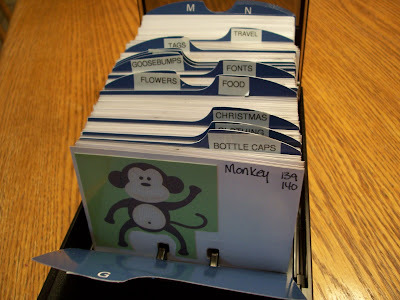 Another great idea of Kim is to keep sort them into categories (an envelope will have flowers, another one trees...) and then photocopy their images. 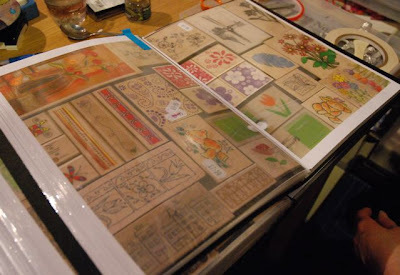 Those copies then go into a folder which acts like a catalog of all the rubber stamps she has. 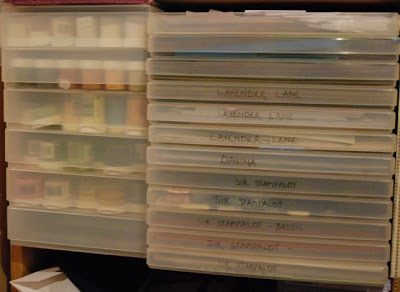 Other stuff includes a large ammounts of embossing powders (above to the left), on going projects for different companies, each in a different 12 x 12" plastic box (above photo to the right). 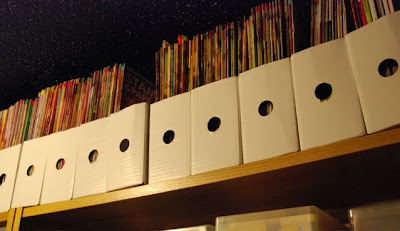 Magazines in holders (above, this is just a tiny section, it goes all round two walls of the studio). All sorts of ink pads sorted by type in the middle shelf of an Ikea unit. 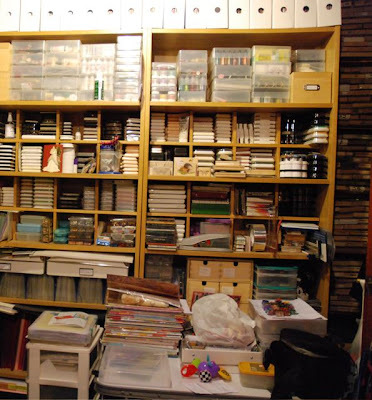 Also Kim displays her new acquisitions in those shelves which are quite prominent. If I rewind back to early year 2000, I would just had bought Martha Stewart Weddings. That was how I found out that Martha Stewart existed. She is/was completely unknown in Spain. Anyway, since then I have been in awe of her. So fast forward to the present. 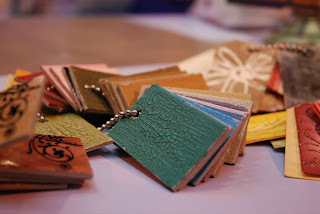 What do I think of the Martha Stewart's Crafts range? 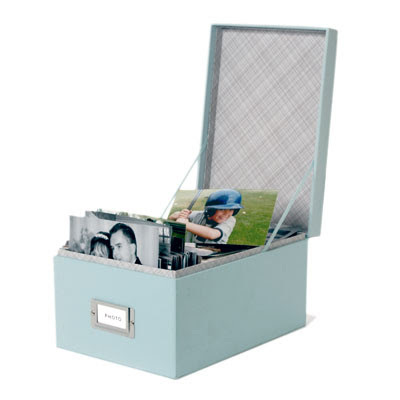 Well, mixed feelings really, but love the presentation and the looks of their storage range. I am not sure if it's pricey, because of the exchange rate so good for us (UK). 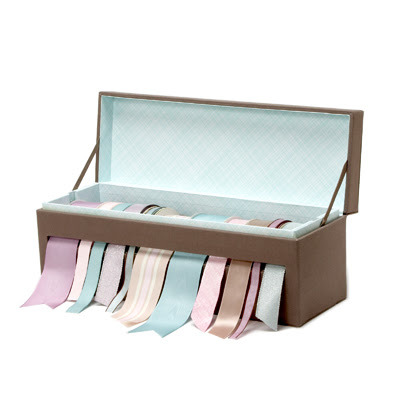 But non the less, here some you have the two things that I so far love, The ribbon box (above in Walnut colour, for more info click here) and the Photo Box (below, in Cloud, for more info click here). As far as I am aware, they are only sold in Michaels and from the Martha Stewart website. Lorna explains how she came up with the idea and how to make it. I thought of the idea when the original packaging that the squeeze came in split and as it sits on an open shelf it was beginning to get dusty. I wanted something to keep it clean, something small and simple. I had just brought a new tea towel set, similar colours to the squeeze, I combined the 2 and hey presto my QK storage bag was born. It was made entirely from materials which I already had. I started by standing the tool (handles closed with velcro cable tie) onto a piece of thick card (cut from old packaging) and drew round this leaving a slight border and this became my template. I also noted down how tall it stood. I then cut a front panel and a back panel a third longer than the front, as this goes over the top of the tool. The 2 side panels and a bottom panel were cut from co ordinating material. (By using the tea towel edges on the top edges it saved hemming and sewing) These were all cut a few millimeters bigger than the base. I then stitched the panels to the bottom panel and then stitched up the sides. The card base was covered in pva glue then material and this placed in the bottom of the bag for stiffness. I stitched some strong ribbon to form a loop onto the side panels for handles. I added press studs to the front for opening and closing. Lastly I die cut the Quickutz logo and attached this with strong adhesive. Today I found the first video of a scraproom. Enjoy! To see more of Dayami's videos, including tutorials, click here. For a link to her blog, click here. Just recently I have found this blog called Papergoddess, which probably many of you already visit or know. 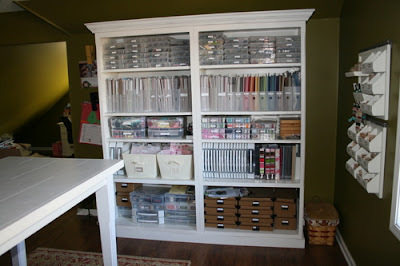 Anyway, the studio section is fabulous and I will try to bring more images and ideas from her to this blog. 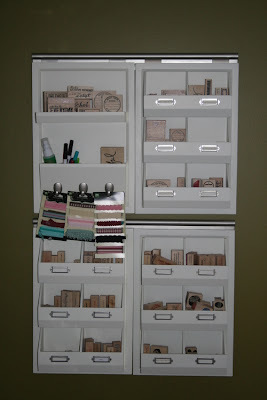 For today I will say that I love this stamp storage idea for the DIY crafter. 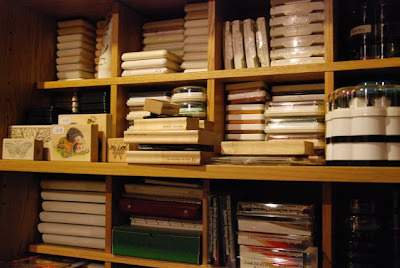 Acrylic frames plus crates= stamp storage. Brilliant. For the full story click here and here. 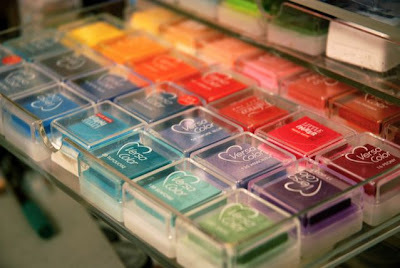 Any crafter will collect a big number of ink pads over the years. No exception here. My favorite ink pads are the ones that come in small size just because they are so much easier to store and the lower price tag is also a good thing. 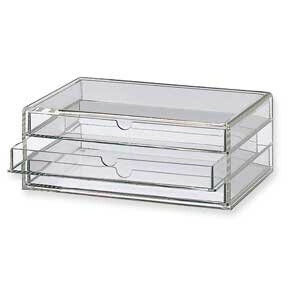 Well this little acrylic set of drawers are what I use for my little ones. It looks like this (bellow) when empty. It is from Muji and cost £12. One good thing is that you can stack more than one on top of each others, so if your collection of ink pads grows you can keep getting more of those! I have two and they hold my collection of Versacolor (they fit 28 per drawer ), Fluid Chalk ones, Brilliance and VersaMagic (the full collection fits into two drawers). 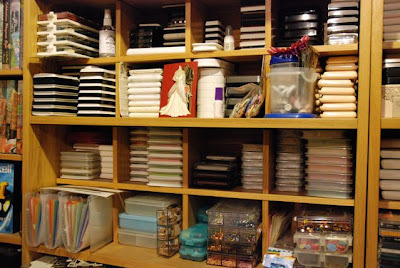 Cardstock, paper, embellisments and foam stamps are stored in this unit. 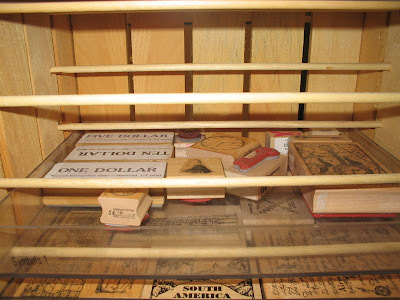 Pottery Barn postman cubbies, storing wood mounted stamps. 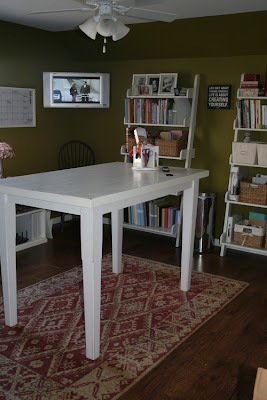 Nichol's favorite work desk from Pottery Barn, with button jars on top, tools like punches and tag makers in the drawers. 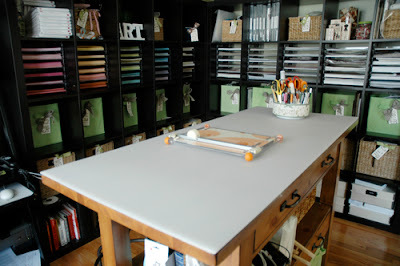 This desk serves as the tool/paper trimming station. Below on the bottom shelf there are some large jars with random trims and lace and a large basket full of wood mounted stamps. I f you would like t see more photos of her studio, click here. If you would like to see her blog click here. 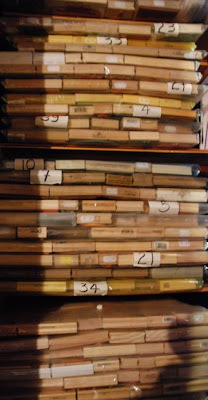 If you have been following this blog for a while, you may remember a post abut Angela Urbano storage of the Quickutz dies. 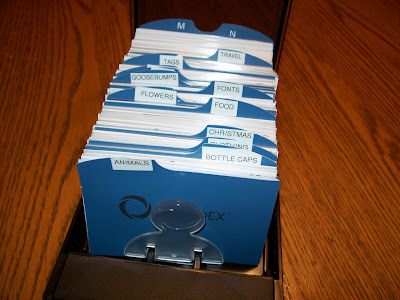 Well, Valerie is the organizational freak who came up with the Rolodex system for Quickutz (in her own words, I would never had use this expression for such an ingenious way to store dies). The different thing that Valerie does is that she also writes the number assigned to each die on the back with a Sharpie pen. 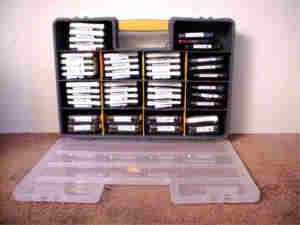 Then, they are stored in the Magpie containers backwards so you can see the numbers easily and know which die you’re looking for right away. It takes a while to do, but certainly makes life easier when you’re done working with the dies and is a snap to put them away. It’s also easy to see if you’re missing anything. Also another good tip from Valerie is to store shapes in the tan containers and the alphabets in the pink ones, or any combination of different colored tins (Magpie tins come as far as I know in tan, pink and silver). Finally, Valerie points out that if you stick a piece of foam in the back of any containers that aren’t full, the dies won't slide around. The system works and it certainly makes it easy to enjoy your Quickutz. This is one of the studios that is worth having a good look through. 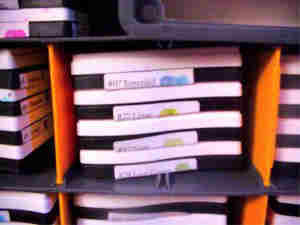 Not only Amanda has lovely storage ideas but also she takes the time to take pictures, to upload them and to explain them. This two are just a simple samples of it. 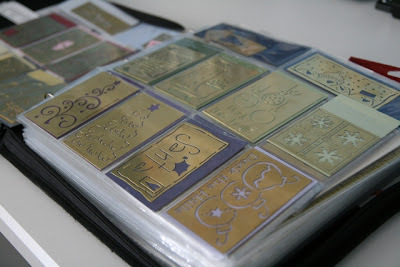 The first one is storing the brass stencils for embossing. Perfect neat storage that allows you to see loads at one. 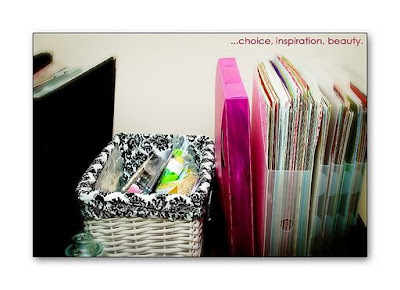 Both of them are Crop In Style Paper Sticker Binder which Amanda uses for storing embossing stencils, stickers, rubons & more. I love this idea. 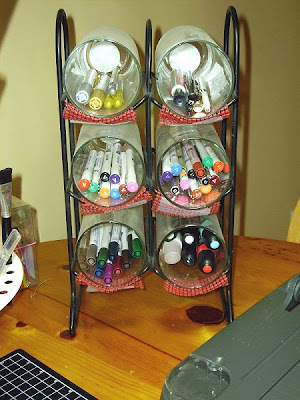 As you know, pens should be storage flat so this idea is perfect. It is an old wine rack Julia was no longer using plus some added vases from a local scrap store. The shed are delivered flat packed! The shed now is ready for the electrics. 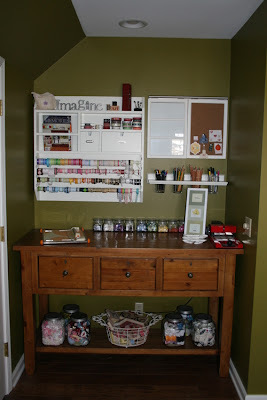 Once the electrics are done, Donna ut a pretty wallpaper and installed her desk and drawers sets. The Shed is 22ft x 10ft, which in metres is 6.7 x 3 m . Donna got this old library Cupboard from Ebay and stores all her paints in it. 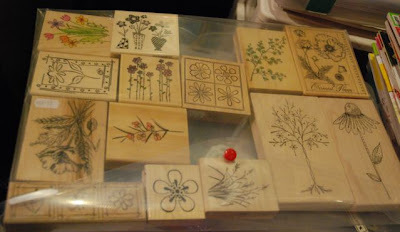 Also, there is a stamp maker in the bottom. The green racks on the left hand side, are from Ikea. 10 chest of drawers in this shed and all of them from IKEA.